MADISON, Wis. (AP) — Ethan Happ had 19 points and 11 rebounds, D’Mitrik Trice hit a long jumper with 23.6 seconds left and No. 22 Wisconsin withstood North Carolina State’s in-your-face defense to rally for a 79-75 win on Tuesday night. Wisconsin’s Brad Davison drew a charging call on Markell Johnson on the perimeter with 16 seconds left. The emotional Davison let out a furious yell and pumped his arms after forcing a critical turnover with the Wolfpack trailing by three. 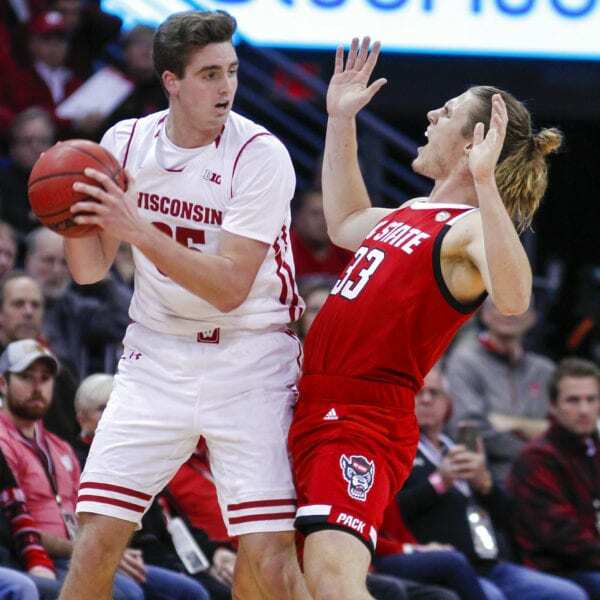 Davison hit two foul shots with 8 seconds left for a four-point lead for Wisconsin (6-1), and a last-gasp 3-point try for the Wolfpack sailed harmlessly off the backboard at the other end. Johnson had 21 points to lead N.C. State (6-1), while C.J. Bryce added 18 and seven rebounds. The Wolfpack controlled tempo for much of the game and answered nearly every run after Wisconsin fell behind 41-29 early in the second half. The Badgers finally broke through in the end, with Happ leading the way in the paint. They got boosts from the 3-point line from Trice, who had 18 points and went 4 of 5 from behind the arc; and Aleem Ford who had 12 points on four 3s. N.C. State: The game had a choppy flow in the first half before opening up in the second. In between the whistles, the Wolfpack mostly dictated the pace with its man-to-man defense and occasional full-court pressures. 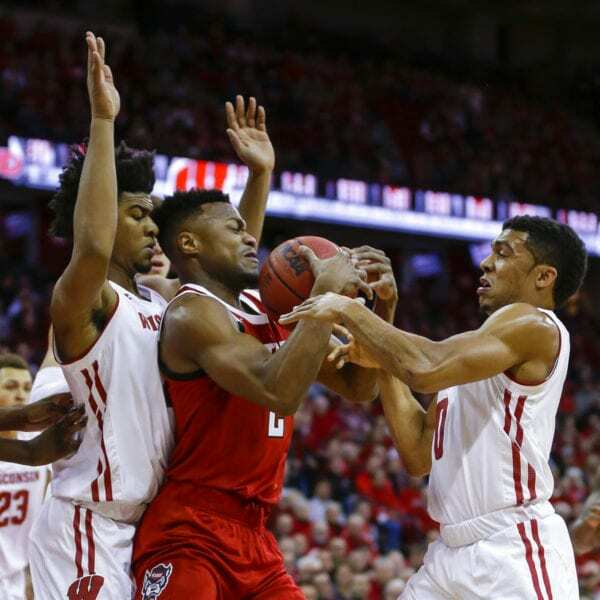 Coach Kevin Keatts’ team had feasted on lower-division opponents in getting off to a 6-0 start, though a close loss to the Badgers on the road proved that the Wolfpack were on the right track. They forced 14 Wisconsin turnovers, seven in the first half, against a team that was averaging nine a game. Wisconsin: Happ had some decent looks in traffic around the bucket but was just 3 of 11 from the field in the first half. The preseason All-American also found open shooters on the perimeter when he got doubled, but Brevin Pritzl and Ford missed a couple opportunities. Shooting improved in the second half, when the Badgers were 62 percent overall and 54 percent (6 of 11) from 3-point territory. N.C. State: Faces Vanderbilt at the HoopHall Miami Invitational on Saturday. Wisconsin: Travels to No. 14 Iowa for Big Ten opener on Friday. Be the first to comment on "Happ Helps No. 22 Badgers Withstand NC State In 79-75 Win"